UK - Leading European flightcase manufacturer 5 Star Cases continues its support of local West Norfolk Swimming Club (WNSC), with the design and supply of some special funky new flightcases to house its timing equipment, which is usually stored at Kings Lynn swimming pool. 5 Star’s Keith Sykes co-ordinated the project, saying: "We were approached by WNSC’s chair Sam Baxter as they needed to be able to stow and transport their timing kit safely and easily. It’s one of their biggest capital assets, so we were very happy to offer a custom solution." Two of the cases each take four timing pads, and both feature a split-top design making the cases as accessible as possible, facilitating extremely quick and easy removal and deployment of the pads from the large cases. They are constructed from 5 Star’s Tour grade specification materials with 9mm ply utilised to minimise the weight, fitted with tough high quality casters tor good portability. These cases also have special drainage slots in the base, so the pads can be stowed immediately they are finished with and removed from the pool, and ventilation slots in the case lids encourage airflow and prevent damp accumulating. The third trunk is a general purpose case to hold all the related computer equipment, control system components, electronic elements and other accessories including cabling, computer tripod and start / stop buzzer. This is based on 5 Star’s popular Eurotrucker range of road-trunks, complete with removable top tray. The cases are all smartly finished in purple high pressure laminate with the distinctive WNSC griffin logo screen printed prominently in white. The Club is absolutely delighted. 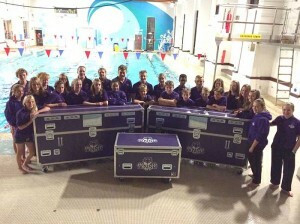 "These cases are great – they are of the highest quality and will allow us to get maximum life out of the equipment. It’s important within an aquatic environment to give the electronics the best possible protection," states Sam Baxter. He goes on to say that support from companies like 5 Star is "essential" for the Club to continue to grow. It has allowed them to channel more funds and energies into coaching and developing their roster of young swimmers, who are currently doing extremely well. The project is the latest in a long line of sporting related projects for which 5 Star has created custom casing solutions, including for championship water skier Jeremy Harford, pilots in the Red Bull Air Race and to transport cars for the International Formula 3000/GP2 Championship. Says Keith Sykes: "I think it’s really important to support local sports clubs and teams where possible. It’s great for the community and the self-development of so many young people. We were very pleased to be able to help out in such a practical and constructive way."